Fred Villanueva creates large scale paintings, sculptures, and time-based installations. His work combines images with abstract and figurative styles. Fred has exhibited in New York City, across the USA, Madrid, Spain, Rotterdam, The Netherlands, and more recently at the New Orleans Museum of Art. Current major projects include the creation of Ash Studios ( www.ashstudios.org ), a monumental scale social practice art project in Dallas. His greatest work is being father to his toddler girl, Rosario Teresia Villanueva. 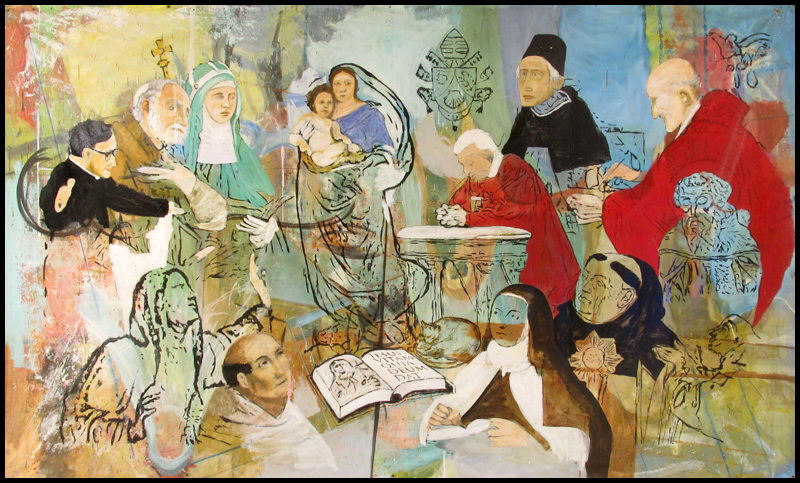 "Pope Benedict XVI at Prayer with the Holy Theologians", Oil and Acrylic on Canvas, Dimensions: 8 ft. x 14 ft. Shown in New York City, and Washington, D.C., for Pope Benedict XVI's 2008 visit to the USA. (after Rubens), and St. Thomas Aquinas(after Crivelli), and St. Bonaventure (after Murillo), and center, Cat (after Leonardo da Vinci). St. Thomas Aquinas(after Crivelli), St. Bonaventure (after Murillo), and center, Cat (after Leonardo da Vinci).